Heavenly Light (Chorus for Mixed Voices (A Cappella)). Composed by A. Kopylow. Arranged by Peter Wilhousky. Mixed chorus. For Soprano, Alto, Tenor, Bass, Piano Rehearsal. 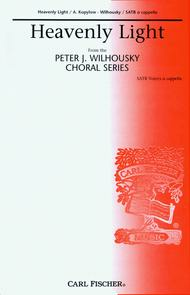 Peter J. Wilhousky Choral Series. Choral. Piano reduction/vocal score. Standard notation. 4 pages. Published by Carl Fischer (CF.CM497).ISBN 0825829488. With Standard notation. choral.